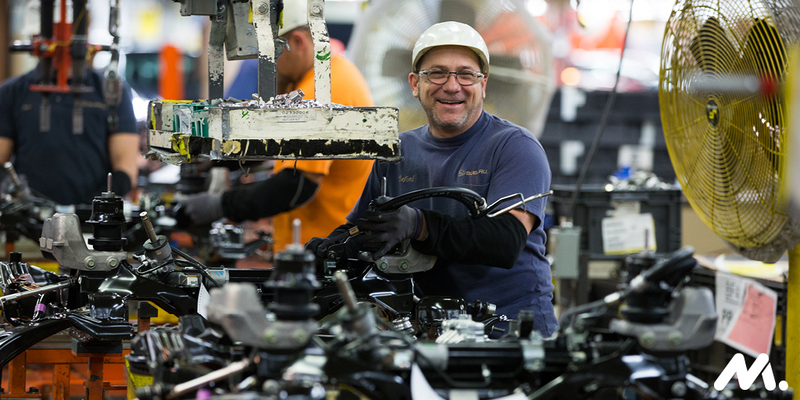 A new report from the United States Census highlights manufacturing as one of the vital backbones of the U.S. economy. But it also identifies the critical role that small manufacturers – those with fewer than 50 employees – play. But there is another face to U.S. manufacturing. Small employer manufacturers (those with fewer than 50 employees) shine in many sectors. For example, 92 percent of the cement and concrete product manufacturing establishments in the U.S. have fewer than 50 employees. These small establishments employ 89,058 people, or over half of all employees in this industry. And they have wide geographic diversity — as can be seen in the map below from the Census Business Builder: Small Business Edition, every state and 2,269 of America’s 3,138 counties are home to a cement and concrete product manufacturer. For example, 52 percent of employees who work in machine shops; turned product; and screw, nut and bolt manufacturing work in a location with less than 50 employees. Similarly, 598 of the nation’s 631 apparel accessories and other apparel manufacturing establishments have fewer than 50 employees. Small cut and sew apparel manufacturers employ over 40,000 people — almost half of all employees in that industry. The U.S. Census participated in Manufacturing Day 2017 this year – with such a large role that small manufacturers play in the United States economy, it’s not hard to see why. More than 90 percent of the National Association of Manufacturers’ 14,000 members are small to medium-sized businesses. Our organization’s mission is to ensure that manufacturers of all sizes speak together with a single voice. Learn more about what the NAM is doing to highlight small manufacturers.